In a city where long waits at bus stop are common and many riders are senior citizens, college student Charles Molnar had an idea: Why not build some benches? Spurred to action, he rallied several students from Detroit Enterprise Academy, a charter school, to make a handmade bench out of recycled wood. Last Thursday, they installed the bench at a bus stop on East Jefferson Ave.
Rather than praise the initiative, however, the Detroit Department of Transportation (DDOT) said the benches are unauthorized and will have to be removed. But Molnar, a 22-year-old student at Wayne State University, has vowed to continue making benches and keep putting them up around the city. He's working with friends and calling the project Sit On It Detroit. Molnar told The Huffington Post that the project serves a real need, because many of DDOT's existing benches are in disrepair and passengers are being forced to create makeshift seats out of objects like newspaper stands (SEE PHOTO BELOW). The city bus agency has been decimated by severe budgets cuts over the last few years. "There [are] grocery carts that are upside down next to bus stops. People are looking for things to sit on," Molnar said. "It's not about whether or not DDOT likes it. This is something that needs to be done." DDOT and the City of Detroit did not respond to requests for comment from The Huffington Post, but the agency has said the project hasn't gone through the appropriate procedures. "There is protocol that takes place," DDOT's deputy director Anjelica Jones told USA Today after the first bench was installed last week, "but it is our understanding that it did not take place regarding this bench." She said submitting an official proposal might help open a dialogue with Molnar and his friends on the topic. Molnar said he already participated in a meeting about the benches with the bus agency last year and received tacit approval that they would not be torn down. Although he's not interested in jumping through "hoops and loops" in order to get the project approved, he insists that the benches are safe. "I've gone through every precaution with these things to make sure they're not a liability," he said. "Every surface has been sanded. I've varnished the whole thing top-to-bottom -- every single piece." After the first bench went up, Molnar and his crew installed another by Scripps Park at the intersection of Trumbull and Grand River. Sit On It Detroit has planned to put up four more benches this week at various locations around the city. 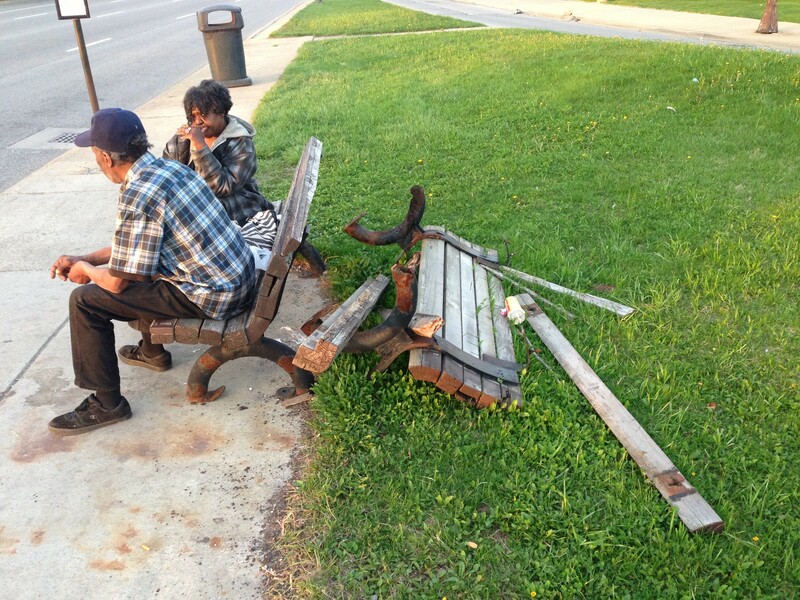 Despite DDOT's threat, none of the benches had been removed as of Monday, according to Molnar. Efforts to put up a bench by Henry Ford Hospital in the city's New Center district have been put on hold, however, after news of the intended location leaked. Molnar said finding the new benches will now become more of a scavenger hunt -- a twist that will make it harder for DDOT to track them down. The Sit On It Detroit crew makes the benches at a warehouse space located near Holbrook and Conant in Hamtramck. Molnar said they use reclaimed wood donated by Reclaim Detroit, an organization that tears down dilapidated homes and recycles the materials. At first, Molnar and his friends envisioned the benches as one-person seats, but over time, the idea evolved. They now feature enough room for multiple people to take a seat, and even feature a nook for donated books for riders to read while they wait. Since the project started, community residents have added their own books to the collection, Molnar said. Kyle Bartell, a friend of Molnar who works with Sit On It Detroit, thinks of the benches as improvised public libraries. He hopes they'll encourage literacy and give riders a little relief while they're waiting at the stops. As for the drama with DDOT, he says he's perplexed. "It's important we all work together," he said. "We're trying to help DDOT. We're trying to make it cool to catch the bus again."